Product positioning goals must be supported by the full marketing mix. Although positioning reflects the target market’s understanding (perception) of the product, it cannot be achieved through the IMC/promotional mix only. All marketing mix elements, particularly the product mix, need to be consistently focused at the end positioning goal. An inconsistent marketing mix will simply confuse the marketplace and result in a weak positioning outcome and/or limited repeat sales. If the desired positioning has been effectively and clearly chosen, then deciding on the marketing mix elements should be relatively straight forward (although implementation is always a challenge). Remember that a product’s positioning is the consumers’ understanding of the product and its specific benefits. Consumer typically form their understanding of the product over a period of time using information from a variety of sources, some of which are shown in the following diagram and then quickly discussed in the subsequent table. IMC mix The firm’s communications mix has a big role to play as it usually focuses on particular benefits and advantages of the product. 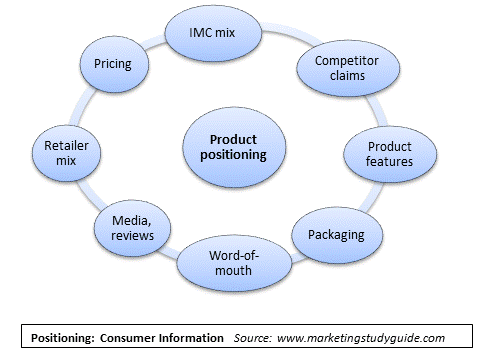 Competitor claims Positioning is viewed on a relative basis, therefore the competitors’ IMC mix (product claims) will also affect the positioning of all products. Product features The actual design and features of the product, particularly when consumers use the product, has a major impact on the perception of the product and its relative advantages. Packaging One of the first experiences the consumer has the product is the look and feel of the packaging. Word-of-mouth Word-of-mouth communication between consumers has a high level of credibility and cut through and will greatly influence positioning. Media, reviews Media discussion/articles or product reviews are also seen as quite credible and independent and will influence consumers’ perception. Retailer mix The type of retailers where the product is sold gives an indication of the product’s quality and status. Pricing The overall price points of the product act as a cue for quality, and a high frequency of sales promotions may suggest lower quality. The following diagram illustrates the delivery of an inconsistent marketing mix. In this case, using a running sports shoe, the goal is to position the product as a shoe ‘for serious runners’. The firm has invested in an advertising campaign in specialist running magazines and websites. While that part of their program is good, unfortunately the balance of their marketing mix offering is not aligned to that positioning. As shown, the product quality is poor as the firm has used low quality materials and they have not invested in a suitable design. They have used discount stores as their prime distribution channel and they have priced shoes at a discount level as well. These marketing mix elements clearly communicate to the end consumer that this is a low quality, budget shoe, and not a serious running shoe as the advertising tries to indicate. This problem is easily rectified by simply aligning the marketing mix to a consistent end. 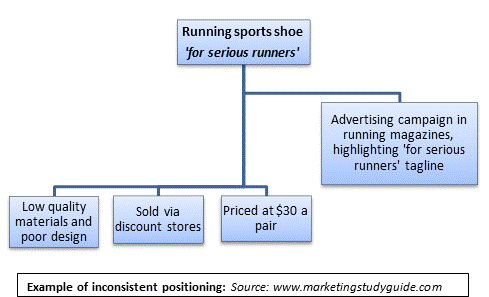 If the firm does want to position the shoe for serious runners, then they need to invest in product improvement with higher quality materials, they would need to access sporting and specialty shoe stores, and the product is to be priced higher. Alternatively, they could change their communications mix and position the shoe as a budget running shoe. Either approach would align the positioning with the marketing mix elements and will generate better sales and enhanced profitability.